On Sunday April 7, 2019, Gabriel Faure’s beautiful Requiem will be presented in its entirety for the 10:00 AM service. 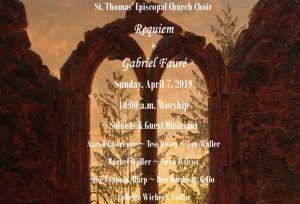 St. Thomas’ Choir, Soloists, and a featured Octet will be accompanied by violin, cello, harp and organ. Faure, one of France’s greatest composers wrote Requiem the best know of his large-scale choral works between 1887 and 1890. The text is based on the Roman Catholic Mass for the Dead with some omissions and amendments. To his Requiem he added the motet, Pie Jesu, and two texts from the Order of Burial, Libera Me and In Paradisum. We hope you will join us for this very special Lenten service as we observe the final days of christ’s journey in the wilderness.